Beware the full moon—Wikipedia’s got werewolves! What it’s about: The idea of people transforming into wolves is an old one, probably beginning with Germanic people in the Iron Age, who used the transformation as a metaphor for a man becoming a warrior. Medieval Christianity was fond of incorporating or reinterpreting earlier myths, and gave the previously positive wolf-man a demonic association. Despite this, the myth spread across Europe, but belief in werewolves didn’t become widespread until the 16th century, when the modern werewolf mythology took shape. Boy meets shirt. Boy loses shirt. Boy meets girl. Boy loses girl. Boy meets girl’s baby. You know what? This isn’t going any place good. Strangest fact: Besides the fact that the Twilight series ends with a werewolf falling in love with a baby? That several cultures, in isolation, came up with their own similar myths. Indian and Chinese mythology include weretigers, although in India, they were sorcerers who could transform themselves, and in China they were victims of a hereditary curse or a vindictive ghost. In Thailand, weretigers were tigers who had eaten enough humans to be able to transform into one. Throughout Africa are legends of werelions and wereleopards, who in some myths are the offspring of gods and humans, and in others are reincarnated royalty. Biggest controversy: It wouldn’t be Wiki Wormhole without a Nazi connection, and sure enough, one of Hitler’s headquarters was code-named “Werwolf” (the German spelling). There was also an Operation Werwolf, which intended to send forces behind enemy lines as the Allies entered Germany, but it didn’t get much further than the propaganda stage. Thing we were happiest to learn: Not all were-animals are dangerous. Elite Aztek soldiers were called jaguar warriors and wore the skins of that animal. Indonesia and Malaysia share a legend of a weretiger called Harimau Jadian, who sometimes seeks vengeance, but often appears to guard farmers’ fields. Thing we were unhappiest to learn: There’s very little consistency among werewolf myths. From the perpetually shirtless werewolves of Twilight, to Lycaon, who was punished by Zeus for serving the Greek god human flesh, werewolves haven’t had a fixed set of characteristics through most of their existence. Sometimes the transformation is permanent, sometimes it’s temporary, and sometimes the afflicted can transform at will. Sometimes a werewolf can speak with a human voice, sometimes it’s feral and uncontrollable. Depending on the legend, one could become a werewolf by drinking rainwater from a wolf’s footprint, drinking beer and reciting an incantation, stripping naked and wearing a wolfskin belt, or being punished by God directly. The contemporary werewolf, who transforms at the full moon and can be killed only by a silver bullet, came from a pair of films that placed the werewolf in the 20th century public’s imagination. The first was Werewolf Of London, (1935), which was hampered by lead actor Henry Hull’s refusal to spend hours in the makeup chair. Lon Chaney Jr. had no such qualms, and became instantly famous for his performance in The Wolf Man (1941), and both Chaney and the Wolf Man went on to long careers in horror movies. Best link to elsewhere on Wikipedia: In some myths, werewolves in wolf form retained some human characteristics. And in others, werewolves in human form still looked wolf-like. This could entail curved fingernails, bristles under the tongue, or a unibrow, which naturally has its own Wikipedia page. The unibrow page discusses varying standards of beauty, and mentions some famous unibrows belonging to Pelicans forward Anthony Davis and cosmonaut Salizhan Sharipov, but strangely, not Frida Kahlo. 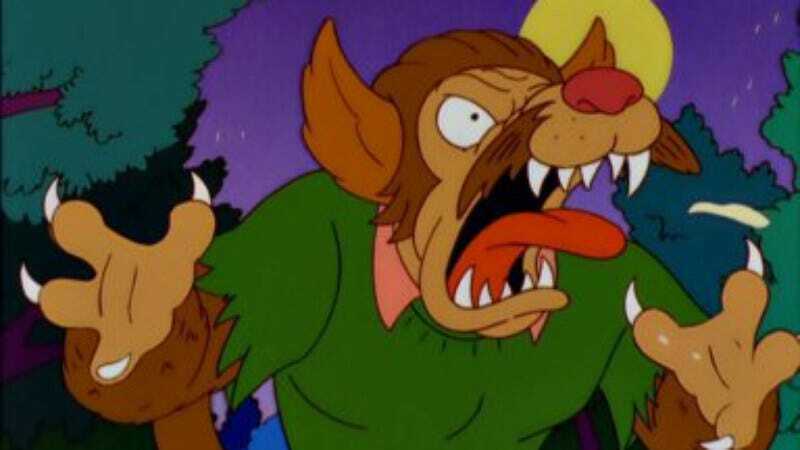 Further down the wormhole: The werewolf myth is old enough to be chronicled by history’s first historian, Herodotus, who wrote of a Scythian tribe who were all transformed into wolves for a few days each year. He also chronicled Ancient Egypt, which is most easily identified by the oldest and largest of the classical Wonders Of The World, the pyramids of Giza. The Giza complex also includes sphinxes of various sizes, and monoliths, one of which is among the largest in the world. We’ll look at more of the world’s largest monoliths next week.